You have to keep challenging your brain to keep it sharp. The trick is to use your brain every day — ideally for things that are at least a little different from anything you’ve done before — rather than just once in a while. The only way that will happen is if the things that keep your brain sharp are also things you enjoy doing. The good news is that your brain has reward systems built into it that encourage you to do what keeps it alive and healthy. You just have to give it the material it needs to do that. The central player in your brain’s reward system is dopamine, a natural brain chemical that feels good. Your brain’s dopamine levels rise when it encounters something new, and dopamine levels remain high at least until the novelty wears off. For each activity, give yourself 1 point for each day per week that you do it. For example, if you do crossword puzzles every day, give yourself 7 points for that. If you play mah-jongg once a week, give yourself 1 point for that. Then, add up all your points for your total score. Among the 75-plus-year-old participants in the study that used this scale, those who got dementia had an average score of 7.5; those who avoided dementia had an average score of 10.6. Subjects who scored in the highest third (over 11 activity-days per week) had a 63% lower dementia risk that those who scored in the lowest third. Mental plus social plus physical: doing group yoga, taichi, or martial arts; conducting music; taking Preservation Society tours of historic homes in your area; sailing; playing charades; acting in amateur drama productions; singing in a choir; touring botanical gardens and learning the names of plants with a friend; taking classes in anything interesting (a language, paper making, furniture restoration, calligraphy) at a local community center or college. Set this as your goal: Whatever your score, raise it by one point every week for 2 months. To get a point, all you have to do is do one more activity one day per week. The way to memorize much larger sequences of data is to analyze them on a level that runs deeper than mere sound. 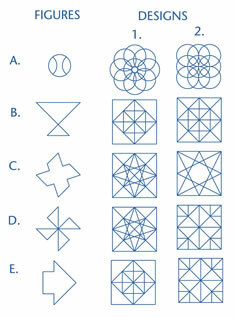 In each row, which of the designs in the right two columns contains the figure to the left? Men tend to perform a little better on this visualization task than women. Interestingly, people with autism (over 80% of whom are male) perform better, on average, than non-autistics. 3 - 17 - 6 - 11- 8. What I want you to do is keep that series of numbers in your head while you perform the multiplication problem below. (First cover up the number sequence you’re trying to remember!) 34 x 47 = ___ All done? Now, what were those numbers? If you succeeded in remembering them, you have an unusually good ability to do two things at the same time. If you didn’t, don’t worry. Just take it as a lesson about the importance of selective attention when you want to remember something. The brain system that gives us our ability to recognize a face is located in the right hemisphere. That system sees the face as a holistic pattern, not a collection of individual parts. 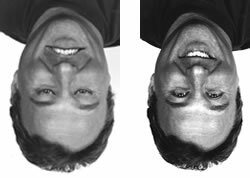 But when a face is turned upside-down, our face recognition faculty doesn’t work very well. We fall back on a strategy of checking individual features, and may not notice that their arrangement is bizarre. Do both these faces look normal? Are you sure?